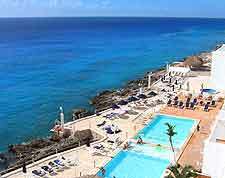 The island of Cozumel features a subtropical climate and is located next to the eastern shoreline of the Mexican Yucatán Peninsula. Much of the weather on Cozumel is affected by the Caribbean Sea, which surrounds the island and moderates the climate. The hottest months on Cozumel tend to be March, April and May, when sunshine is particularly plentiful and levels of rainfall are at their lowest. Average temperatures of around 26°C / 79°F can be expected at this time of the year, together with pleasantly warm nights. The average annual daytime temperatures in Cozumel are around 24°C / 75°F.